Not long before he died Jimi Hendrix was asked who he felt would be the future of Blues guitar playing to which his answer was ZZ Top’s Billy Gibbons. What Hendrix recognised was that blues guitar playing was a constantly developing art, one which took many influences to create new styles. Gibbons and his l’il ol’ band from Texas took the delta blues and mixed it with the Cajun and Mexican rhythms that he’d grown up with to make something completely new. Likewise with Jimmy Page, in the UK, who took his blues in a more folky and traditional route, ZZ Top drove the blues on into the future. Since that time there have been many artists who’ve put their slant on blues guitar playing keeping that style and genre fresh and vibrant. And in that tradition we now have an artist who is as much the future of blues guitar playing today as Billy Gibbons was to Jimi Hendrix in 1970. 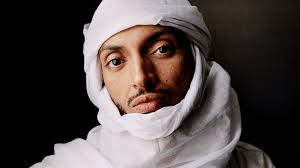 I first heard of the Taureg musician from Niger, Bombino, when I saw him play on the Later With Jools show on BBC TV in support of his 2011 album Agadez. The fluidity of his playing, supported by an excellent band, immediately got the hairs on my neck standing up, this was a moment of sheer euphoric knowledge that I’d just witnessed something really very, very special. This was blues music not only being taken in a new direction, but a direction of huge cultural, political and social significance. It was therefore with great expectation that I waited for the new album, Deran, to arrive through my letterbox. Hoping for further development of the bands sound, I have not been disappointed in anyway at all. 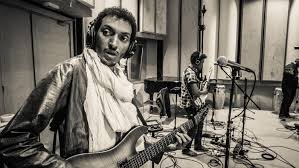 The guitar paying is immense, sympathetic to the rhythms that underpin the songs with space consistent with the environment that Bombino has grown up in and been influenced by. The singing adds texture to the music, creating an otherworldly effect reflective of the alien, to those of us from outside of the Sahara, lands from which this music is born. And like the album I recently reviewed, Temet by Imarhan, the tales and stories told are an important link to the oral tradition of Bombino’s ancestors, keeping alive his culture and his pride in his people; with songs such as Imajghane (in English ‘The Taureg People’) and Tamasheq (‘The Taureg Language) the identity of Bombino and his peoples shines through as a beacon in the struggles they’ve faced, and continue to face. 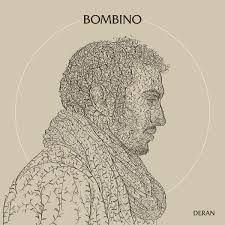 The correlation to the struggles of the former slaves of the deep south of America to the Taureg people are obvious; the way Bombino develops the blues to tell his story is completely realistic and significant. Deran is a work of fabulous beauty that develops both the traditional music of the Taureg people and blues guitar playing in a totally amazing way. Its vibrancy is contagious, its sound surrounds you, its importance as a piece of cultural and political art is immense. Bombino has taken the blues to a place that the great Jimi Hendrix, I’m sure, would have appreciated, lauded and enjoyed, perhaps even loved. As an introduction to the music of Saharan North Africa this album works brilliantly; as an album of virtuoso blues guitar playing this album is hugely important, intensely enjoyable and beautifully significant.